As Girard-Perregaux re-enters the halls of the SIHH in 2017 after a five-year absence, during which the brand presented new products at Baselworld, the 226-year-old Swiss watchmaker today previews a few of its 2017 debuts. One new model features the company’s world timer module, called WW.TC (World Wide Time Control), placed into the dressy 1966 collection for the first time. The second SIHH preview is Laureato 34, a diamond-bezel version of the steel-cased Laureato, which Girard-Perregaux re-introduced last year to great acclaim in a 41mm version. Last year Girard-Perregaux celebrated its 225th anniversary in part by re-introducing its Laureato, the brand’s groundbreaking 1970s steel watch design featuring a 41mm octagonal bezel and integrated bracelet. 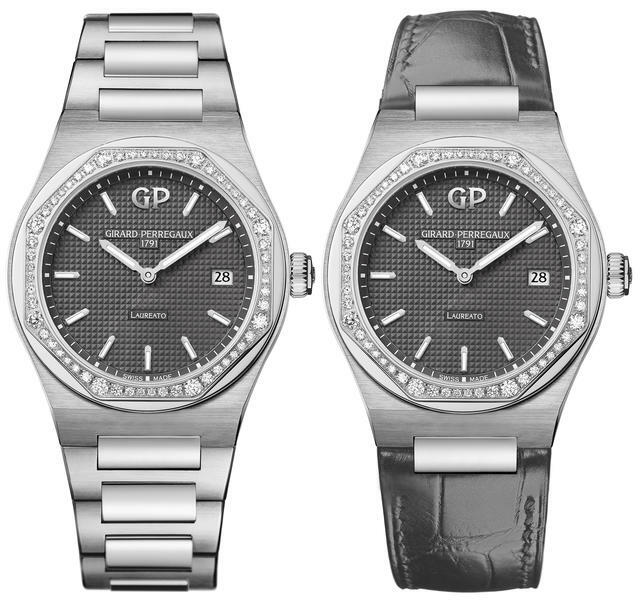 Now Girard-Perregaux adds a ladies’ design to the collection with a diamond-bezel Laureato 34. Available in steel, in gold or a combination of the two, the new watch is thinner than last year’s 41mm model (7.75mm compared 10.1mm for the larger model) but retains the same geometrical design that focuses the eye on the round dial framed by the eight-sided Laureato bezel as penned in 1975 inspired by Gerald Genta. Likewise, the finishing remains as before: a satin-brushed bezel conceals a polished ring in turn sitting atop an equally satin-finished case band. The Laureato 34 comes with a silver-toned, slate grey or blue dial, graced with baton-type hours and minutes hands, as well as a date display. In the new two-tone variation, the body of the watch is in steel, while the bezel, crown and interlinks are made of gold. Girard-Perregaux has set the bezel with 56 diamonds in sizes that vary according to their position. Similarly, the metal bracelet model features links of tapered size. Its first links are the same width as the case, while the last ones close to the clasp are distinctly narrower. This progressively slimmer design also applies to alligator strap Laureato 34 models. The second 2017 SIHH preview for Girard-Perregaux is the 1966 WW.TC. 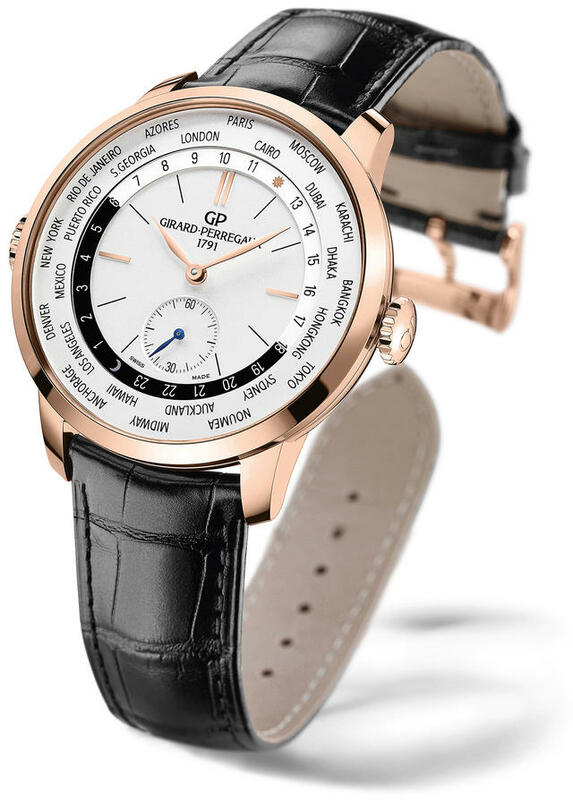 Here Girard-Perregaux revives its own world time function, which has been absent from debuts in recent years, and places it into the dressy 1966 collection for the first time. You may recall that the 1966 collection is distinguished by its slim case, slim polished bezel and a broad opaline dial set with leaf-shaped hands. 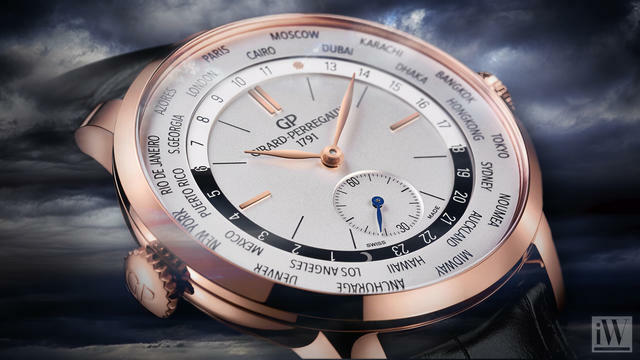 Girard-Perregaux now places into this design a chapter ring of cities of the type that marks many high-end world timers, but with a no global map or color-coding. The 1966 is, after all, the home of the brand’s dressiest collection. The 1966 WW.TC. city disc is set into a 40mm case (smaller than previous WW.TC models that typically measured 41mm-44mm across) surrounding two black/white semi-circles to distinguish between day and night. Settings are performed via the two crowns at 9 and 3 o’clock: the first serves to position the reference city at noon; and the second to adjust the hours and minutes – with which the 24-hour disc is set automatically. 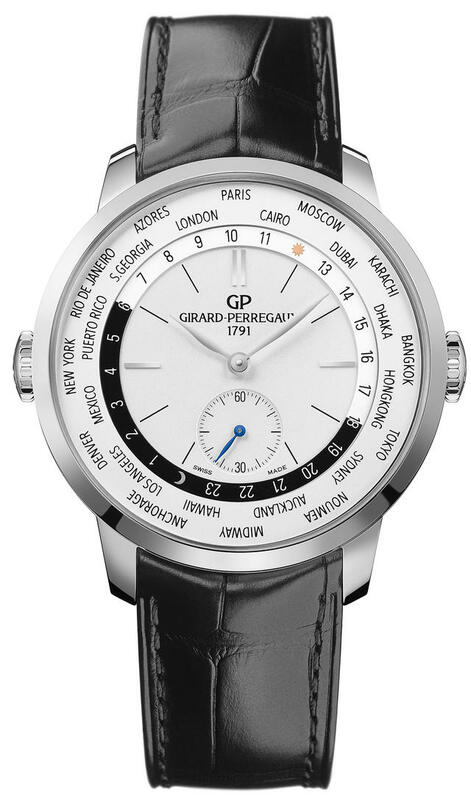 Unlike many such world timers, this caliber (GP GP03300-0022) enables the time and reference city to be set in both directions. The watch is available in two versions: one in pink gold with a black alligator leather strap, and the other in steel. Prices will be available following the SIHH in January.